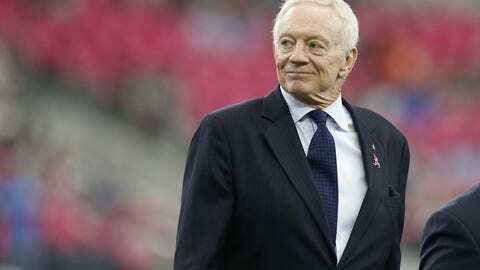 Dallas Cowboys owner and general manager Jerry Jones indicates the team will go after a premier pass rusher this offseason. Stop me if you’ve heard this before, but the Dallas Cowboys need a pass rusher. Not exactly breaking news, I know. If you’ve been a fan of America’s Team the past few years, this is not a new narrative for you. The need for more pass rushers in Dallas is old news. Yet, it is somehow all too relevant. It’s not like the Cowboys brass have been sitting on their hands when it comes to this obvious position of need along their defensive line. Their attempts to bring in these “war daddies” via the draft and free agency simply haven’t panned out. For the last three years, the Cowboys have drafted pass rushers relatively high. In 2013, they traded up to the 34th selection in the second round to pick Boise State defensive end DeMarcus Lawrence. But the 24-year old has been plagued by injuries and inconsistent play. A year later, the Cowboys drafted Nebraska pass rusher Randy Gregory. But the once touted top-ten level prospect will only play 12 games in his first three seasons in Dallas due to injury and drug-related suspensions. Last year Dallas used one of their two fourth round selections on Oklahoma defensive end Charles Tapper. But a back injury robbed the developmental pass rusher of his entire rookie season. MUST READ: Should the Dallas Cowboys trade up for Myles Garrett? But the Cowboys brass didn’t just look to add pass rushers to their roster via the draft alone. They’ve also took some chances in free agency. Most notably, Dallas signed controversial defensive end Greg Hardy back in 2015. That failed experiment only lasted one season. Last offseason, the Cowboys gave a three-year, $8.25 million deal to former Oakland Raiders defensive end Benson Mayowa. After a slow start and being a healthy scratch for three-straight games, Mayowa ended up leading the team in sacks with 6.0. Four of which came in Dallas’ final five regular season contests. Despite Mayowa’s efforts, Dallas’ defense still ranked 26th against the pass in 2016. The Cowboys know they need a premier pass rusher to put more pressure on opposing quarterbacks. Especially after their single-game playoff ousting at the hands on Green Bay Packers’ quarterback Aaron Rodgers. Cowboys owner and general manager Jerry Jones is well aware of that fact. And he plans on doing something about it this offseason. “Where” is certainly the question. The Cowboys have tried the draft. They’ve tried free agency. Maybe, their next move is to trade for an established veteran. One name to watch is New York Jets defensive end Sheldon Richardson. According to reports, the Jets tried to trade the 26-year old to Dallas last season. But their asking price of a first round selection in exchange was too high. Richardson was named NFL Defensive Rookie of the Year in 2013 and to the Pro Bowl a year later after posting 67 total tackles and 8.0 sacks. Last season, the former first round pick recorded 62 tackles and 1.5 sacks in 14 games. One red flag that could hurt a possible deal is the fact Richardson is rumored to have been benched more than once by the Jets for being late or outright missing team meetings.